Mission on Mission last Friday night felt a little bit like a tourist on an African safari. However, instead traversing the Serengeti, I was transecting one of San Francisco’s more diverse neighborhoods, the Mission. 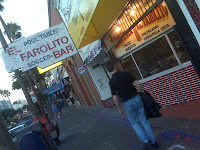 With Savanna Jazz behind me, El Farolito Bar awaited just 2 blocks ahead. For personal protection and to blend in with regional wildlife, safari attire has traditionally consisted of khaki clothing, bush jackets and pith helmets (remember Banana Republic circa 1989?). Working from the same premise but addressing a totally different type of “wild-life,” I donned a black hoodie and jeans to travel Mission’s 2500 block. While there were no acacia trees or any desert brush obscuring my path, I did encounter pot holes and a lot of concrete. As I hiked through the neighborhood the vibrant storefronts clashed with the smells oozing from the city’s pores and BART rumbled underfoot on its way to the 24th Street Station. The dissonance of the city made my ears yearn for the oasis of the rhythmic jazz from my last stop. I turned into the den of El Farolito noticing that I walked a full block before arriving at the bar which hasn’t happened since Canchola's Bar. 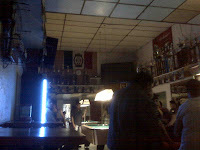 The cavernous bar was lined with a variety of soccer trophies and a smattering of TVs showcased an undisclosed soccer game with only a few of the bar’s denizens cheering for a victory. El Farolito is home to a number of species and though I did not find any mighty lions or speedy cheetahs, I did discover a unique species of zebra-hippo and a few machito meerkats. Squeezed into a silver, zebra-print, too-small-skin-tight top with white pants and silver high heels, the zebra-hippo waitress shimmied up and down the bar delivering drinks to the patrons as her heels clicking under hoof. Small in stature and hovering around the pool tables in the rear of the bar, the machito meerkats huddled skittishly in groups drinking their beers and watching the waitress intently. Standing a good “head” above the other wildlife in the bar, I was clearly the giraffe on this safari. Among the bar’s other thirsty inhabitants I spotted a rare creature—the zigzag bearded monkey. The specimen entered the establishment late in the evening and almost slipped by my watchful eye. Though I was unable to take of photo of this rare breed, I did find a similar specimen online (see photo on the right). I was also able to witness a surprising mating ritual between the zigzag bearded monkey and the zebra-hippo. In the savannah that is El Farolito most species coexist without issue; however, when threatened the wildlife can become extremely dangerous. As I arose to leave, one of the machito meerkats said something to offend the bartender who quickly retaliated. Picking up the ice scooper, she quickly shot a handful of ice with viper-like speed directly to his face. Startled by the speed and accuracy of her attack, the bartender’s scooper assault instilled in me a fear deeper than that of the “knife sharpener” at Canchola’s. I have no doubt—that had she so desired—she could have taken out one of his eyes with an ice cube.